Napoléon Bonaparte (15 August 1769 – 5 May 1821) was a French military and political leader during the latter stages of the French Revolution. As Napoleon I, he was Emperor of the French from 1804 to 1815. His legal reform, the Napoleonic Code, has been a major influence on many civil law jurisdictions worldwide, but he is best remembered for his role in the wars led against France by a series of coalitions, the so-called Napoleonic Wars. He established hegemony over most of continental Europe and sought to spread the ideals of the French Revolution, while consolidating an imperial monarchy which restored aspects of the deposed ancien régime. Due to his success in these wars, often against numerically superior enemies, he is generally regarded as one of the greatest military commanders of all time. Napoleon was born in Corsica to parents of noble Genoese ancestry, and trained as an artillery officer in mainland France. He rose to prominence under the French First Republic and led successful campaigns against the First and Second Coalitions arrayed against France. In 1799, he staged a coup d'état and installed himself as First Consul; five years later the French Senate proclaimed him emperor. In the first decade of the 19th century, the French Empire under Napoleon engaged in a series of conflicts—the Napoleonic Wars—involving every major European power. After a streak of victories, France secured a dominant position in continental Europe, and Napoleon maintained the French sphere of influence through the formation of extensive alliances and the appointment of friends and family members to rule other European countries as French client states. Napoleon's campaigns are studied at military academies throughout much of the world. The Peninsular War and 1812 French invasion of Russia marked turning points in Napoleon's fortunes. His Grande Armée was badly damaged in the campaign and never fully recovered. 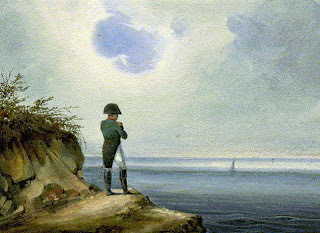 In 1813, the Sixth Coalition defeated his forces at Leipzig; the following year the Coalition invaded France, forced Napoleon to abdicate and exiled him to the island of Elba. Less than a year later, he escaped Elba and returned to power, but was defeated at the Battle of Waterloo in June 1815. Napoleon spent the last six years of his life in confinement by the British on the island of Saint Helena. An autopsy concluded he died of stomach cancer, although this claim has sparked significant debate, as some scholars have held that he was a victim of arsenic poisoning.